Over the past several years, the IT industry has seen solid-state (or flash) technology evolve at a record pace. Early on, the high cost and relative newness of flash meant that it was mainly relegated to accelerating niche workloads. More recently, however, flash storage has “gone mainstream” thanks to maturing media technology. Lower media cost has resulted from memory innovations that have enabled greater density and new architectures such as 3D NAND. 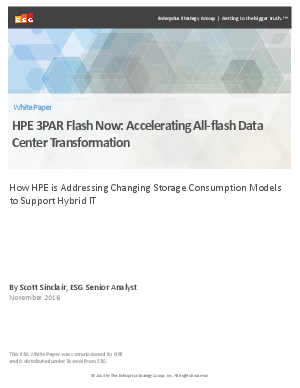 Simultaneously, flash vendors have refined how to exploit flash storage’s idiosyncrasies—for example, they can extend the flash media lifespan through data reduction and other techniques.